Evolving Solutions Perspective – IBM z14 pervasive encryption strength versus the IBM z13 server platform and prior platforms. Pervasive Encryption is an approach where the enterprise implements encryption for their Application Data (Sequential Datasets, VSAM), their Database Data (DB2, IMS/DB) and all network traffic entering or exiting their Large Systems server. As a reminder, clients consider this capability given the ever increasing threat of a platform breach followed by compliance centered primarily on the EU GDPR and penalty avoidance planned to go live January of 2018. Dataset level encryption is made possible by updating the DFSMSdfp component of the operating system with service that allows extended format data sets to be tagged for encryption at the time they are created. Once “tagged”, the access method leverages the cryptographic primitives to both encrypt and decrypt the data set. Clearly, a bulk unload-reload of the file is required for existing data sets. To create an encrypted data set, you assign a key label to the data set when it is created. 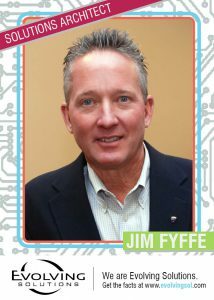 A key label can be specified through the use of data set profiles, JCL, or the SMS data class ACS routine. 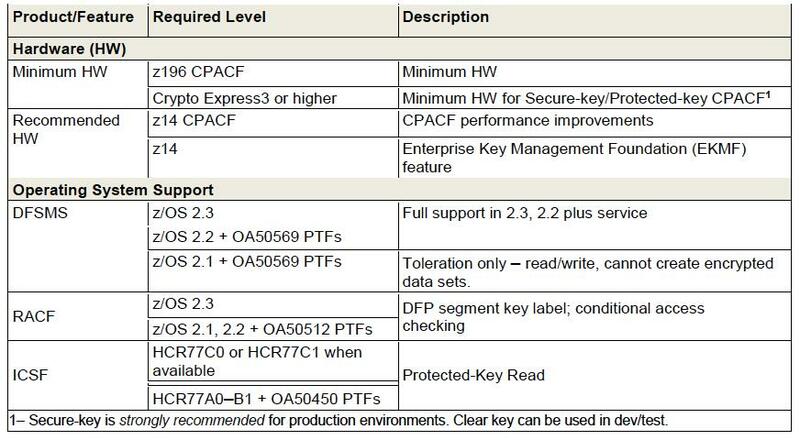 This key label points to an AES-256 bit encryption key within the Integrated Cryptographic Service Facility (ICSF) key store known as the Cryptographic Key Data Set (CKDS). The keys that reside within the CKDS are enciphered with a symmetric AES master key that resides within a hardware protected boundary found within the CryptoExpress-5S or 6S, an optional but highly desirable feature. Especially when considering the EU GDPR 4% penalty and the value this secure key store offers your enterprise. Reading between the lines, it is clear that ICSF will take a very active role on protecting your most important assets. ICSF provides API access to the cryptographic primitives that will provide high performance hashing, SSL handshake offload and encryption/decryption support. Prior to this Pervasive Encryption capability, clients were required to code to these API’s in support of data set encryption. That is no longer necessary. Clients have the option to implement data set level encryption by policy. IBM’s Resource Access Control Facility (RACF®) is used to define that policy; data set profiles are used. RACF controls data set access by identifying and verifying authorized users and by preventing unauthorized users from accessing data. This is accomplished using these profiles. When you study the above table and focus on the minimum hardware platform, you might ask, “Why would I ever consider investing in IBM’s latest server technology?” After all, IBM clearly states that pervasive encryption will run on older server technology, the z196 platform and it’s follow-on, the z13 class server. There is a very good reason to consider investing in the IBM z14 platform, consider the following. The above graph represents an estimation of the additional MSUs required to implement data set encryption on 75% of the I/Os from this CPC. Note how much lower the green MSU burn rate is. 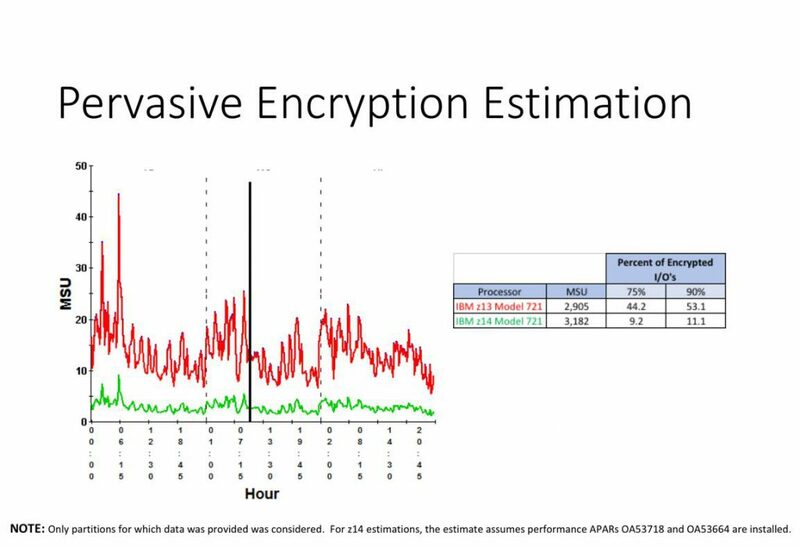 This rate represents the incremental MSUs required to support encrypt/decrypt for that same workload running on an IBM z14 Server during that same peak period. Versus, its z13 counterpart; granted a very capable alternative with a strong cryptographic primitive stack – just not as efficient as its follow-on. Clearly, Pervasive Encryption significantly reduces the time and effort required to demonstrate GDPR compliance. Pervasive Encryption significantly reduces the compliance scope as so much data is now Off the Compliance Table – it is covered. Real-time self-service audit verification is now possible given extensions to the IBM zSecure offering. In addition, a QRadar APP is available that takes the zSecure Audit results and exposes them on a dashboard. From an Evolving Solutions perspective, as you consider the costs – benefits on implementing Pervasive Encryption, strongly consider investing in server technology that will both improve your risk posture and provide a positive return on security investment. The IBM z14 platform makes for a smart investment. If you are interested in a complimentary study for your organization, feel free to reach out to me via LinkedIn or send me an email at jim.f@evolvingsol.com. Learn more about Evolving Solutions enterprise server solutions. Evolving Solutions next article will center on Machine Learning on the IBM z14 platform. As data grows, today’s enterprise-class server solutions must work faster and provide new levels of data security and protection in the data center. Data breaches impact not only the company’s bottom line but erode consumer trust. Did you know that of the 9 billion records stolen since 2013 only 4% were encrypted (IBM)? Also, a new IBM report found that the number of records compromised grew by 566% in 2016 from 600 million to more than 4 billion. The risk of a breach is now at the doorstep of every data center. 80% of data on personal mobile phones is encrypted but the rate of data encryption in most enterprise data centers is much less and sometimes even zero. Traditional enterprise-class server solutions have not been able to encrypt data at high levels. Typically, encryption has taken a lot of compute power which slows applications leading to a less than ideal user experience. Because encryption is expensive and eats up compute power, most companies have practiced only selective encryption, leaving part of their data centers vulnerable. What if your company could practice pervasive data encryption? IT leaders from high transaction volume industries such as banking, retail and healthcare have been looking for a solution to encrypt everything to improve data security and protection. IBM’s z14 server solution is the answer. As IBM calls it “pervasive encryption” is now an option. Its z14 server solution provides the ability to encrypt everything while not hurting compute power or breaking the bank. 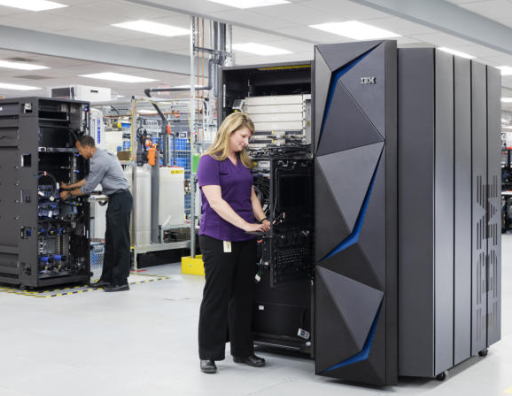 The system’s advanced cryptographic capability extends across any data, networks, external devices or entire applications, and IBM z14 allows data security personnel to centrally manage millions of encryption keys – more keys equals safer data. In fact, IBM z14 server solutions encrypt at a rate of 18x faster than the x86. An enterprise-class server solution that delivers more data security and protection is now here. Contact us to learn more about the new IBM z14 and how it can better protect your data center.